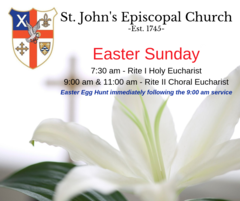 Welcome to St. John's Episcopal Church in Huntington, New York! We are people of all ages and backgrounds from Huntington and beyond. Tuesdays, at 11:00 am in the Guild Room. There will be no Bible Study on April 30th. Saturdays at 10:00am. Parishioner Alice Weiser will continue offering gentle yoga classes in the Great Hall, Saturday mornings through the month of June. Beginners are welcome. $20 per class. Contact Alice at aliceweiser@mac.com. No class on May 4th. Sunday School will meet again on April 2th at 9:40 am in the Canterbury Corner. There is no Sunday School on Easter Sunday. We're looking for young musicians who play strings, woodwinds, brass, classical guitar, harp. Saturday, May 4th at 10:00 am at the Cathedral of the Incarnation in Garden City. Sunday, May 5th at the 10 am service. 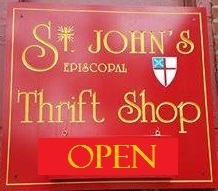 St. John's Thrift Shop in Huntington Village offers gently used, seasonal clothes and a wide selection of everyday items. Volunteers needed. Please contact the Parish Office for more information or call (631) 427-1752 ext. 106. On February 24th, St. John's Huntington did a pulpit exchange with our sister church, St. Augustine's in Brooklyn. Here is our Rector, Rev. Duncan Burns, preaching. Click on the picture to be redirected to the video post. Click on the image to see The Most Rev. Michael Bruce Curry's message to the Church.